The International Dark Sky Places conservation program recognizes and promotes excellent stewardship of the night sky. The award-winning International Dark Sky Places (IDSP) Program was founded in 2001 to encourage communities, parks and protected areas around the world to preserve and protect dark sites through responsible lighting polices and public education. Communities are legally organized cities and towns that adopt quality outdoor lighting ordinances and undertake efforts to educate residents about the importance of dark skies. Parks are publicly- or privately-owned spaces protected for natural conservation that implement good outdoor lighting and provide dark sky programs for visitors. Reserves consist of a dark “core” zone surrounded by a populated periphery where policy controls are enacted to protect the darkness of the core. Sanctuaries are the most remote (and often darkest) places in the world whose conservation state is most fragile. UNSPs are sites surrounded by large urban environs whose planning and design actively promote an authentic nighttime experience in the midst of significant artificial light at night, and that otherwise do not qualify for designation within any other International Dark Sky Places category. Dark Sky Friendly Developments of Distinction recognize subdivisions, master planned communities, and unincorporated neighborhoods and townships whose planning actively promotes a more natural night sky but does not qualify them for the International Dark Sky Community designation. 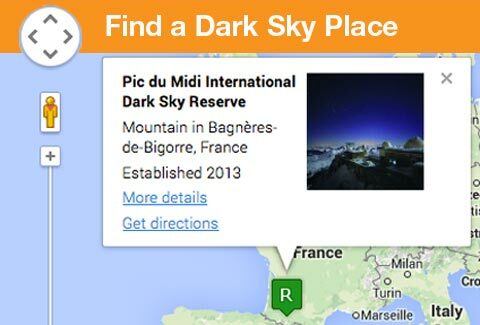 Where are the International Dark Sky Places located? As of mid-2018, there are over 100 certified IDSPs in the world. See where they are located, and find more details for each, on our interactive map. How are International Dark Sky Places designated? IDA designates IDSPs following a rigorous application process requiring applicants to demonstrate robust community support for dark sky protection and document designation-specific program requirements. Applications are reviewed bimonthly by an IDA standing committee composed of dark sky experts and previously successful program applicants. Regular status updates ensure that designated places continue their commitment to dark sky preservation. Upon certification, IDA works with certified places to promote their work through media relations, member communications, and social media. An International Dark Sky Place designation helps enhance the visibility of designated locations and foster increased tourism and local economic activity. Ready to begin a nomination? Learn How To Become An International Dark Sky Place.